Many of the first chefs were former military men, who had cooked for their superiors to try and impress them. Escoffier, the father of french cuisine, was one of these men. 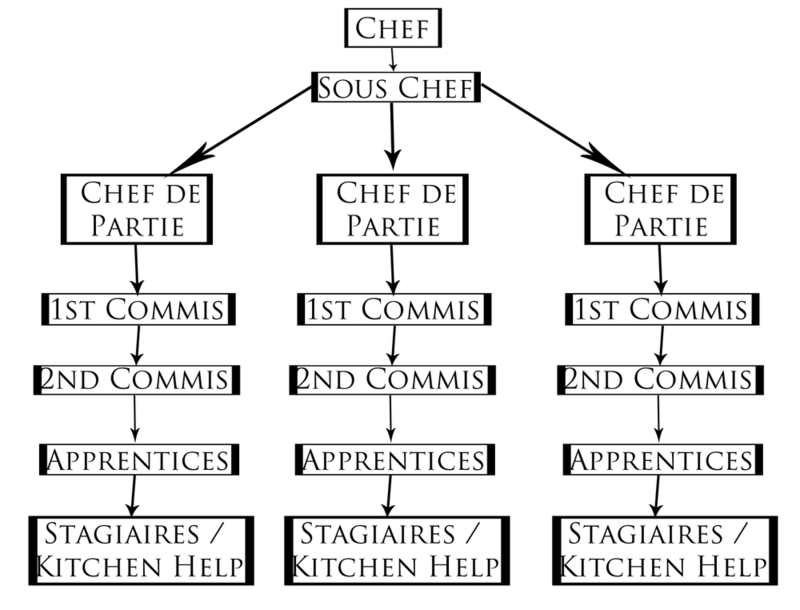 Along with writing “Le Guide Culinaire”, he took his military experience and adapted it to the kitchen to create the brigade system. This system covered everyone from the chef to the dishwasher and from the dining room manager to the busboy. This hierarchical structuring is still used today. One’s rank in the kitchen was able to be seen visually by the height of their toque (hat). The chef’s was the tallest, and so he also got the name ‘Gros Bonnet’ or Big Hat. Working in this system, people would rank up based on their technical abilities, knowledge, experience and leadership and management potential. It wasn’t uncommon to have a younger person higher ranking than an older. Quite often it was one’s character that brought them up the ranks. The success of the brigade system lies in how tasks are broken up, everyone has a different job. The saucier makes stocks and sauces; the entremetier makes soups, eggs and vegetables; the garde manger does all of the cold kitchen work, manages the walk-in fridge and often takes care of receiving. Most establishments can’t afford the luxury of breaking things down this way, it would require too many people to do properly. So, as a result, the modern chef needs to be a master of all domains, he needs to be able to bake pastries one moment, then jump back over to the stove and make the sauces for the evening. It’s more common to see a small crew of people running the kitchen, doing everything and completing tasks in all areas as assigned by the chef. This operation is less expensive to run and can put up the same quality as a larger brigade, so it’s easy to see why many people have moved away from the full brigade. However, the hierarchy from the brigade system remains. The chef is the man in charge of the kitchen and everyone else needs to know that. Knowing the roots of the brigade system is important for anyone looking into a career in the culinary field. It allows you to look more critically at the systems you may be a part of, and will help when you have to structure this sort of thing yourself. It’s already been proven to work. Adapt it to your needs. Knowing the brigade system may help you avoid offending someone when you start a new job or go into a new kitchen. Additionally, the more of this kind of background knowledge you have, the more involved you’ll be in the kitchen. It helps create and push the passion for food and cooking, which is of utmost importance.